Tonia Couch and Sarah Barrow have defended their title at the British Diving Championships, setting a national record in the process. 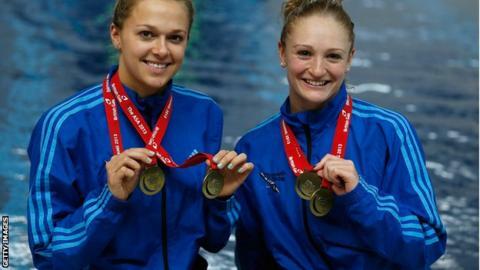 European Champions Couch and Barrow, both from Plymouth, secured a score of 327.66 to take 10m synchronised gold. The silver went to the pair of Rebecca Gallantree and Jenny Cowen, who finished over 20 points behind Couch and Barrow with a score of 304.14. Georgia Ward and Shanice Lobb claimed bronze with 272.28. After their win, Couch said she was delighted with the way her and her partner recovered from an early setback to win the title and break the record. "It means a lot, especially as my first dive wasn't the best," she told BBC South West Sport. "But our optional dives were really good and we got a British record so we're really pleased." Barrow added: "We keep on improving year after year. It's hard with synchro because you only improve a slight amount of points at time, but we're really pleased this time."